Team members from 3 Blind Mice Window Coverings Southern California location volunteered with Amor Ministries to construct a new home in Tijuana. Scot, Renee (of 3 Blind Mice Southern California Team) Eva Guadalupe & family. Our staff usually specializes in the installation and assessment of new window treatment trends, but in this case, Scot and Renee helped with the construction of a safe, secure, and new residence for this Mexican family. Take a peek at the video/photo gallery in this post to see their full experience with Eva Guadalupe, the Amor Team, and the other volunteers. Over Valentine’s Day weekend Head Cheese Scot Dietz and 3BM employee Renee took a trip south of California to Tijuana to give back to the community. Joining the Amor Ministries they helped build a new home for a family in need. It only took three days to complete this home for a mother and her three children. 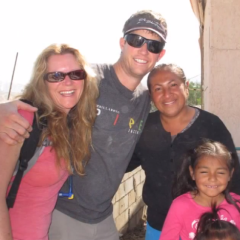 Scot Dietz participates in community service projects in Southern California each year. In this project Scot and Renee joined the Amor pastors in service to the communities of Baja California that have a strong need for safe and secure housing. Scot encourages all of his employees to engage in their community and to give back through whatever means they can contribute. To volunteer for Amor 3 Day trips you don’t need a bunch of people together to volunteer, just sign up on their website. Starting in 1980, Amor Ministries is a non-profit 501 (c)3 christian organization that’s sole purpose is to do outreach in the poorest areas of Mexico and South Africa. Scot and Renee went with Amor on their Southern California routine 3 day trip to build a two bedroom house with a simple enough design that the volunteers don’t have to use any dangerous power tools to complete. Amor typically builds an 11’x22’, two-room home with a concrete floor, stucco-finished exterior, weather sealed roof, two windows, and a door. La Cocina, the kitchen service run by Mexican pastors’ wives and their congregations, provides the team with meals for the weekend. They cook their own recipes and take care of meals, snacks, coffee, water, Gatorade, you name it. Tables and folding chairs are also provided.